Kindergarten or first grade students can study published writers to learn about how to be better writers themselves. Instead of the teacher telling the students how to write, students pull that same information about writing out of a shared experience like reading the same book together. Students can see that writers have a beginning, middle, and end, or that good writers plan before they write. Learning about an author as an example of good writing gives students a context for developing a story that people will read and enjoy. They discover techniques and aspects of good writing that they can use in their own writing. In Part 1, students begin the author study and discover characteristics of writing in books by Laura Numeroff. Part 2 requires students to apply what they have learned about writing to their own writing using Writing Workshop and Author’s Chair experiences. Part 3 extends the study to encompass students with a variety of strengths and abilities. Allow four to six weeks for exploration of Laura Numeroff books in your classroom, ideally in the early part of the year so that her other books can be used to make connections to writing throughout the year. It is not necessary to read a book by Laura Numeroff every day, but aim for several each week. Reread often. Hearing a book more than once is a great way to give opportunities for students to make connections to their lives. Reading the same book two or three times helps students develop important reading skills like predicting story events. Check with your school or public library for a variety of titles. 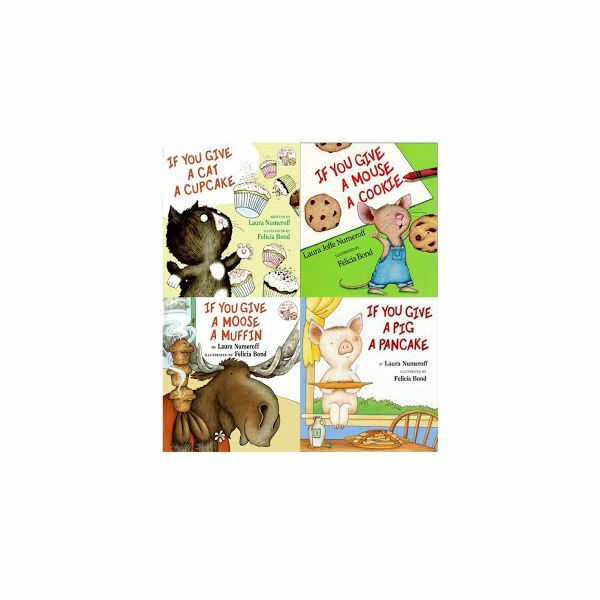 Introduce the author study through a read aloud of one of Laura Numeroff’s books such as If You Give a Mouse a Cookie. Read the “about the author" section and show a picture of the author if possible. Before you begin the story, ask students what they already know about books and writing. Define vocabulary like author, illustrator, title and topic. Begin a list on large chart paper titled “What We Know About the Author Laura Numeroff." Use the students’ words and observations to build an informative chart over time. Be sure to hang the chart where students can see it during Writing Workshop. Model aspects of her writing as you read aloud. For example, “I just noticed the author Laura Numeroff is writing about animals in this book." Or “Look, I just realized the title matches the story." Each time you read a book by Laura Numeroff, read the “About the Author" section. Refer to and add new information to the chart as you build your knowledge of literacy as a class. Record student observations in their own words so they can have some ownership of the ideas contained therein. Guide students to look for things they could do in their own writing. The illustrations have lots of details. She thinks before she writes. There are animals in her books. The title matches what we see and hear in the book. Laura Numeroff has written a wonderful selection of books for young children. Stories like, If You Give a Pig a Party, or If You Give a Moose a Muffin, are entertaining examples of good writing. You can use these titles in the classroom to help your students grow as writers. As you introduce or reread a Laura Numeroff book to your class, give them an additional task to help them connect writing and reading. The second or third time you share a Laura Numeroff story, assign students to think while they listen to you read the book. The first time students hear a story, they need to focus on the charaters and story so they can comprehend its meaning. This time, give them the task of thinking about what she does best as a writer and be ready to discuss it afterwards. Read the book aloud and discuss the definition and characteristics of good writing. Students should volunteer answers appropriate to their grade level and experience. Examples include using words to tell the story, pictures match the words, space between words, adding details, topics are funny and interesting, etc. Ask guiding questions if these answers do not emerge. The next day, or next read aloud opportunity, show students another book by Laura Numeroff and ask them to identify the title and author. When they realize it is by the same author as the book that they heard yesterday, ask them what they expect from this book. Will it have a mouse? Will it be funny? Begin a list on chart paper titled Things Good Writers Do. Hang up the chart where students can see it during Writing Workshop. Each time you read a book by Laura Numeroff, or any other writer, refer and add to the chart. Record students’ observations of these characteristics. Use words and letters to tell the story. Pictures have lots of details. The title tells the topic. During Writing Workshop students have time to choose their own topics and write independently. The teacher talks individually with children about how they are doing as writers. There conferences are a great time to highlight a particular skill that the student does well, as well as skill that could be further developed. Use this time to choose something the student does that good writers do, like leaving space between words, and help the student see themselves as a serious writer by pointing out that this is something that the author Laura Numeroff does well also. In the Author’s Chair, or sharing time, section of Writing Workshop, students read their writing to their classmates who give them feedback on what they are doing well as a writer. The teacher can refer students to the “Good Writers" chart to look for things their peers are doing well as writers, like Laura Numeroff does. This makes the feedback more specific and helpful to the students.